It wasn’t long ago that most children walked to and from school each day. Council’s Healthy Moves Program aims to increase the number of children using active transport to get to and from school. Many primary schools run a supervised walking school bus regularly, and primary schools across the City have nominated walk to school routes. 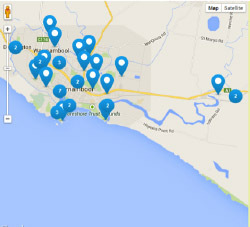 There are 25 walk to school routes at walkingmaps.com.au/discover. Just put in the postcode – 3280 and the keyword ‘school’ to see all the maps available.